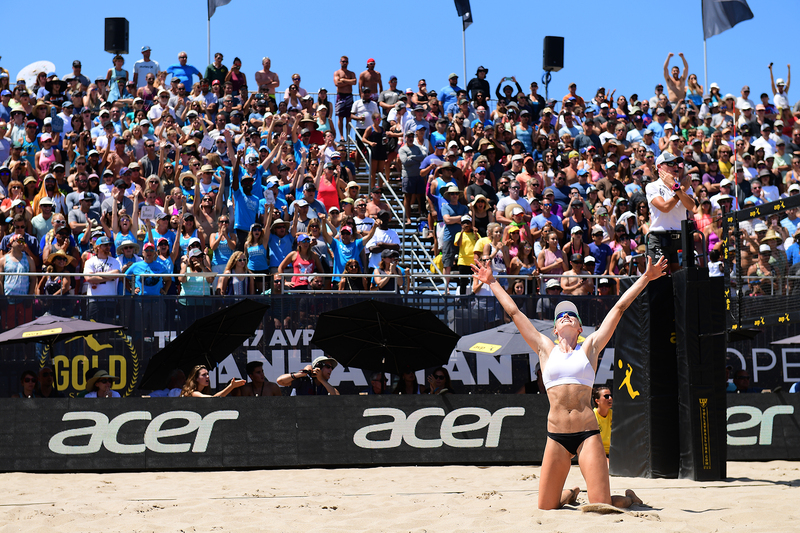 This last weekend the AVP Gold Series/Manhattan Beach Open Presented by Acer took place on the golden sands just south of Los Angeles International Airport. The imagery of flying is an appropriate one as these elite athletes soared, swooped and showed off amazing feats of athletic skill sets. By the time the sun tumbled into the Pacific, four champions had been crowned. Phil Dalhausser and Nick Lucena took home the honors on the male side of things. Brittany Hochevar and Emily Day scored on the distaff side. Gildshire Magazines would like to introduce you to the winners and their main competition during the weekend’s festivities. Brittany Hochevar: A native of Fowler, Colorado, Brittany Hochevar has made her name far from the ski slopes of her home state. A graduate of Long Beach State, this six-footer is a threat to win each and every time she steps on the sand. A setter par excellence, her name dots the record sheet at her alma mater in assists, digs, and block assists. A great believer in the empowering women movement, Brittany Hochevar wants to set an example for those who watch her play on the AVP circuit. *Trivia note* Brittany’s brother is Major League Baseball pitcher Luke Hochevar. Emily Day: Brittany Hochevar’s partner in beach volleyball success is none other than Emily Day. The AVP Gold Series/Manhattan Beach Open was home sand for this talented athlete who stands 6’1″ and is an imposing setter and scorer. Emily’s win with Hochevar is just the latest in successful partnerships she has formed in the last five years. She teamed up with Summer Ross for a third place finish in the 2014 St. Petersburg event, only to take home top honors a year later while working with Jennifer Kessy. *Trivia note* To classify Emily Day as a math whiz would be an understatement. She names “A.P. Calculus Instructor” as a possibility after her sports career winds down. Phil Dalhausser: If you see a 6’9″ athlete you can be forgiven if “power forward” comes to mind, but the hardwood isn’t where Phil Dalhausser practices his craft. This native of the town made famous by America’s “Ventura Highway is the LeBron James of the beach volleyball circuit, at least on the male side. His stack of awards include 34 international titles and 83 first place finishes overall. A 14-year veteran of the circuit, Dalhausser shows little sign of slowing down. Working with Todd Rogers, he won Olympic gold in Beijing during the 2008 Games. *Trivia note* Dalhausser has at least one Fédération Internationale de Volleyball (FIVB) title every year for the last 12 years. Nick Lucena: Dalhausser’s partner in crime this last weekend was the talented Florida State graduate Nick Lucena. He debuted in 2003 teaming up with Dalhausser. The accolades continue to pour in for this team even 14 years later. Though more than effective on the offensive side of the game, Lucena’s stock-in-trade is suffocating defense. In fact, Lucena scored the award for 2008’s AVP Most Improved Player and Best Defensive Player. *Trivia note* Lucena shouldn’t have trouble staying close to the game even after he retires. His degree is in Sports Management. Nicole Branagh and Brandie Wilkerson: If rankings were all that mattered these two shouldn’t have shared the sand with the Hochevar/Day team, but share it they did. They acquitted themselves very well. Ms. Branagh played indoor volleyball internationally for the US National Team. She counts herself a proud Golden Gopher from the University of Minnesota. Ms. Wilkerson calls Lausanne, Switzerland home and is rising through the rankings. Her top ranking before this year was 100th in 2016. This season she stands 42nd. Sean Rosenthal/Trevor Crabb: This was a much-anticipated matchup, as Dalhausser’s Number Three ranking would clash with Rosenthal’s Number Four positioning. Two grizzled veterans in a pitched battle on the Manhattan Beach sands. In the end, it was Dalhausser (along with Lucena) who took home the prize. However, not without a spirited effort on the part of the vanquished. Rosenthal calls nearby Redondo Beach his hometown. Crabb matriculated at both Long Beach State and the University of Puget Sound during his collegiate years. He actually played collegiate basketball for the Loggers of Puget Sound. In 2015 he finished third in the Manhattan Beach event, playing alongside his brother, Taylor. Gildshire Magazines was both excited and honored to be at Manhattan Beach for some of the festivities. It was a lively and knowledgeable crowd. We look forward to returning.